I was not at all prepared for this book, with its true tragedy and subtle beauty. The ending will linger in my mind forever and create echoes of soft whisperings whenever I am near the seemingly smooth surface of a river. George Eliot has, once again, left me with a feeling of emptiness and despair. But this time my sorrow is too deep for tears and impossible to put down in exact words. I almost feel like I have been ripped to pieces; as if a little and insignificant piece of my heart has been torn from my chest and put in between the pages of this particular paperback. Not only is Eliot, as always, a master of characterization, her descriptions of nature and golden moments also feel so real, touching and graceful. Her story unfolds in clear and vivid coloring, like one of Philip Wakem's carefully drawn pictures. And while the plot does take some time to reach its full potential, it is extraordinarily beautiful in its bloom. Maggie Tulliver is a wonderful main character, so likable, gentle and genuine - almost an improved version of Dickens' Amy Dorrit. Tom Tulliver is perfectly complex; constantly changing from an affectionate brother to a dominating tyrant. But oh, Philip Wakem and Stephen Guest stole my heart, in the exact same way they stole Maggie's. I really felt her confusion, as I was torn between those two men as well; the tortured artist or the more classic attentive and adoring suitor. I couldn't choose. 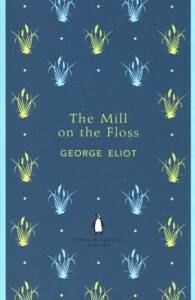 "The Mill on the Floss" will stay with me forever. Its ending is a storm, a whirlwind, a natural chaos of occurrences, feelings and hopes. I desperately hoped 'till the very end, praying silent prayers for the lives of fictional characters. I got completely sucked into the fluent stream of prettily arranged words, and I drowned in Eliot's bittersweet sea of melancholia. And I will need to return to this novel again someday, and be heartbroken all over again. It is just that beautiful.